With today’s emphasis on an active, healthy lifestyle, most men and women feel a lot younger than they look. Aging, acne-scarred and sun damaged skin, wrinkles and fine lines around the eyes, and brown spots often mask your inner beauty. Fortunately, there is a revolutionary, new aesthetic treatment based on Pixel Radio Frequency, also called RF Pixel that provides a fresh chance to turn back the clock on signs of ageing. This treatment repairs scars, sun damaged skin, acne-scarred skin and helps in skin resurfacing. RF Pixel treatment can be used to – Improve conditions present in superficial and deeper layers of the skin. Treatment indications include – Skin resurfacing, treatment of wrinkles around the eyes, treatment of pigmented lesions, such as age spots, sun spots, melasma and treatment of scars resulting from acne, chicken pox, surgery, or trauma. After RF Pixel Treatment, your skin generally feels softer, looks smoother and tighter, and pores are usually smaller. How it works – To appreciate the benefits of RF Pixel Treatment, think of a photographic portrait or digital image in need of high quality re-touching or colour balance. Just as a damaged painting is delicately restored one area at a time, or a photographic image is altered, pixel by pixel, the RF Pixel improves your appearance by affecting only a fraction of your skin at a time with thousands of microscopic RF Pixel spots. It’s like Photoshop for your face! RF Pixel Treatment restores a more youthful look by helping reverse the appearance of ageing, acne scarring and sun damage. The visible results of ageing are superficial blemishes – broken capillaries, freckles (lentigos), and keratoses, scars, fine wrinkles and deep furrows. Benefits of Accent Ultra RF Pixel when combined with other RF therapies – This unique ‘fractional’ approach is a major step forward in providing significant cosmetic results with minimal downtime, especially when used in conjunction with other unique treatments for skin tightening and recon touring and rejuvenating your skin. This combined technology embraces multiple RF therapy that cannot be achieved with other light based treatments. This advanced treatment is the first cosmetic RF device to provide an effective, gradual procedure that creates new skin with no downtime. Time required for the treatment – RF Pixel Treatment can be performed at Skin & You Clinic, Mumbai, in most cases without any topical anaesthesia. Treatment takes about 30 minutes, depending on the size of the area(s) being treated. Because the procedure does not “ablate” or remove the outer skin layer, patients can resume routine activities right after treatment. Swelling is minimal and generally resolves on the same day. The skin will have a pinkish tone for 2-3 days. Number of sessions required – For optimal improvement, a series of 3-5 treatments 2-4 weeks apart has been shown to be most effective. The time between treatments varies from patient to patient depending on individual healing and the depth of treatment. Results are both immediate and progressive, with noticeable and beneficial effects accumulating over 1-3 months. Collagen regeneration will continue for up to 6 months. Accent Ultra RF Pixel – A Proven Treatment For Acne Scarring. For most people RF Pixel represents the most advanced new wave of clinically proven treatments available as it improves sun damaged skin, acne scars, chicken pox scars without the downside of surgery. We recommend a planned course of treatments for the best results. One must have a ‘maintenance’ session scheduled every 3-6 months, combined with the most suitable take home skincare range for your skin. Why Skin & You Clinic For Providing the Accent Ultra RF Pixel Treatment? 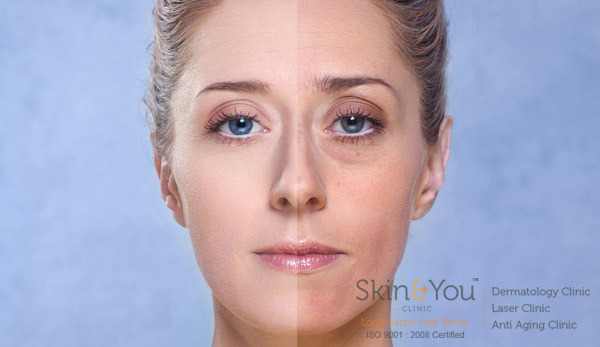 We at Skin & You Clinic, Mumbai, specialize in this innovative technology and treatment. We understand our patient’s needs and concerns. We believe that no downtime procedures are the future of skin care. © 2012 Skin & You Clinic. All rights reserved.